Just about every property owner in Canada is familiar with snow. In a Northern country, snow is just a part of life but it does not need to be a part of your ‘to-do’ list. Instead of bundling up and facing the elements, call a professional for your Rocky Mountain House snow clearing and salting. There is more to maintaining a clear and passable walkway than pushing snow off to the side. Snow can fall in stages or all at once, but in either case, it needs to be removed quickly. Even as much as an inch of snow can create an unsafe environment for yourself, your guests or your potential customers. As important as timing is, it can be difficult to keep up with! 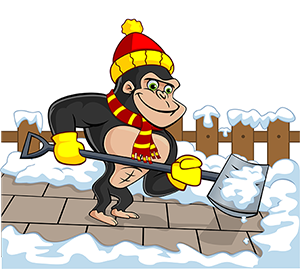 Instead of reacting to snow falls or temperature changes, call Gorilla Property Services for preventative planning. Our Gorillas are trained to monitoring incoming temperature drops and storm fronts in order to keep ahead of them. By keeping an eye on what is coming, our Gorillas are always prepared to clear snow and ice away from your home or workplace. What Sets A Gorilla Apart? Instead of showing up with shovel or machine to help remove snow, our Gorillas treat your property according to its individual needs. A small property can be treated quietly with the use of a shovel. Most snow falls and melt freezes over night and during early morning hours. This is very inconvenient for those of us with regular sleep patterns. Gorillas, however, are always ready to work. Our Rocky Mountain House snow clearing and salting is available for 24/7 emergency call outs when necessary. Shovels might work for walkways and home access but larger tools are necessary for larger spaces. Small retail spaces and multi-unit properties can be tackled using snowblowers while parking lots require a plough.